Two Old and Crazy Guys! Old Hands at Comedy, or just Old Comedy? 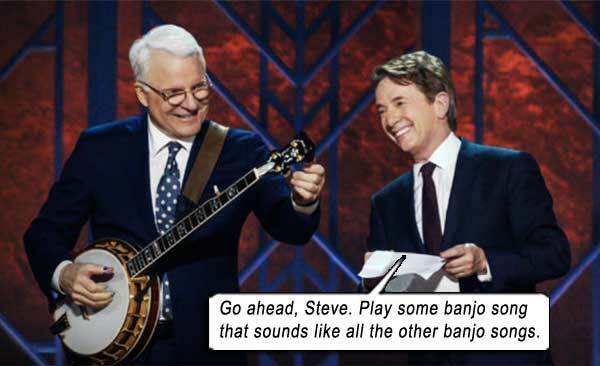 The aptly-named STEVE MARTIN AND MARTIN SHORT: AN EVENING YOU WILL FORGET FOR THE REST OF YOUR LIFE is a cavalcade of roasting comedy, political puppetry, jazz anecdotes and bluegrass banjo that you truly will not remember. 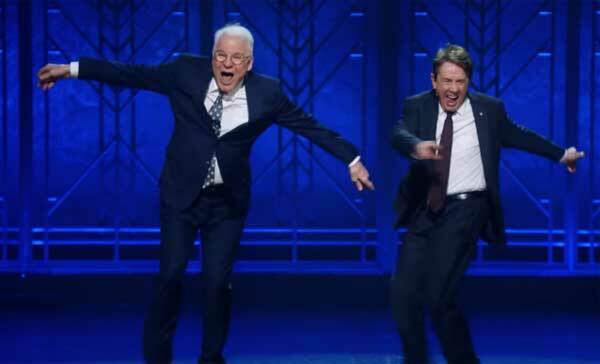 Comedy legend Steve Martin and comedy somewhat-well-known Martin Short team up for a two-man show, in this Netflix Special filmed at the Peace Center in Greenville, South Carolina. It’s funny, yes; at times, very funny. But they’ve given us the outcome in the title. It’s not memorable. There is nothing here to sink our teeth into and take away to repeat to the beer buddies. Not while that new ferocious breed of comedian is out there – like Anthony Jeselnik, Ricky Gervais, Sarah Silverman, Louis CK, Chris Rock – whose anecdotes don’t just wash over us like a warm, familiar summer breeze, but stab us in the neck. Martin and Short provide some good moments, as they play off each other in cringeworthy scripted bits; they provide some great moments with off-the-cuff ad libs and war stories about celebrities, yet the whole night is tinged with that hackneyed, vaudeville delivery that defined the halcyon era of these two very old comedians. You can tell just from those two supposed zingers that the show isn’t exactly going to blow your skirt up if you’re under 30. The way the two stars pick on Babko is a little uncomfortable, firstly because he’s not a “name” like they are – i.e. “Why are they picking on this nobody?” – and secondly, Babko is not a great actor, so he’s not selling his reactions. Steve’s musical collaborators since 2009, The Steep Canyon Rangers accompany him on some dispensable bluegrass, where Steve shows off his banjo skill, explaining before he starts, the differences in the shapes of the banjo and guitar: “The banjo has a round pot and it projects the sound outwards, and the guitar – can get you laid.” Good joke. Problem is, we’ve already heard an old man tell jokes that wipe the floor with this rag of a joke – George Carlin (on War, on Christianity, on Censorship, on America…). So we see that it’s no excuse being “old” – it’s that Martin and Short pander to that lukewarm demographic who don’t want to think too hard to find anything funny. The friendship of the two stars comes through, but it doesn’t blaze like a sun; Short jokes about their “fake showbiz relationship” – and due to the show feeling a little too rehearsed, a little too staged, that’s the feeling we’re getting out here too, guys. They claim their friendship started on the set of 1986’s THREE AMIGOS, which was Short’s first movie, one of Martin’s unfunny movies, and another of Chevy Chase’s unfunny movies. The high point of the night is most definitely Martin Short appearing as his 2001 Hollywood talk-show host alter ego, Jiminy Glick, in mini-form, as a kind of puppet in Steve Martin’s hand. In this character, I have the utmost respect, admiration and awe for Short, as Jiminy is an unadulterated ad-lib genius, having clashed tongues with every major Hollywood star in his three Seasons on PRIMETIME GLICK, including impressing the hell out of the King of Comedy himself, Jerry Lewis! Unfortunately… here, Jiminy’s acerbic tongue is reserved for current politics, not cutting nearly as deep as it should, as pictures of celebrities and politicians are shown – from Closet Mike Pence to Witchteat Kellyanne Conway, to Hillary and American President Vladimir Putin, and Jiminy does a short left-leaning rant on each. Noticeably missing from the sheaf of pics is the top of the dogshit pile – Dumbo Donald himself. They don’t need any more reasons for people to forget this evening. Martin is 73 and Short is 67. The irony and/or truth of the title is that those old enough to appreciate this type of olden days humor probably won’t remember it by next week anyway! Writers: Steve Martin, Martin Short. Starring: Steve Martin, Martin Short, Jeff Babko, Steep Canyon Rangers.